Great location if you have a car. You can walk 10 min to get train to Zermatt. The rooms are spacious and clean with views. The staff was exceptional and the property was maintained beautifully. The apartment was better than the pictures online. I would go back every year. The apartment had comfortable beds, even the extra bed was of good quality. The bathroom was great with a nice rain shower, hair dryer and towel heater. The kitchen was well equipped with an oven and large fridge. Great value for the money. Spacious, Great view and modern style. Everything was white, if not clean easily can be spotted. Manager was a great guy and very helpful. Everything else was fantastic! The staff was very helpful, the rooms were very clean and modern. They even have their own train stop right by the hotel so you dont have to walk to the train station but rather just to the back of the hotel! If I ever come back to the area, we will definitely stay here again! Renovated, well equipped and spacious appartment for low prices. Train connection with near station is perfect, on the other hand, more trains during whole day (in both directions) would be much more convenient. Apartment is a quiet well and good equipped with kitchen's staff. Host waited us on the reception until we arrived (late evening) and help to order pizza. Bed and bedding facilities are very good and you can be sure that sleep well after skiing days. Lock in a great price for PREMIUM Apartments @ Monte Rosa – rated 8.9 by recent guests! PREMIUM Apartments @ Monte Rosa is located 2,650 feet from the Täsch Train Station for quick access to Zermatt and the Matterhorn Mountain. It offers an indoor pool, free Wi-Fi in public areas and free parking. All apartments in the PREMIUM Apartments @ Monte Rosa have an private bathroom and are equipped with a kitchenette. For a small fee you can use the washing machine and the dryer. A tennis court, a sauna, a solarium, a playground for kids and a fitness room are also available in the PREMIUM Apartments @ Monte Rosa. The swimming pool and the gym can be used free of charge. From Christmas to Easter, the train stops several times a day at the hotel's platform. When would you like to stay at PREMIUM Apartments @ Monte Rosa? Studio with an open-plan living room and a fully equipped kitchenette. A Nespresso coffee machine is provided. A private bathroom is fitted with a rain shower and a hairdryer. Towels and linen are included. Please note that daily cleaning service is not included. One set of towels and bed linen is included. These can be changed for a surcharge. Apartment with a south-facing balcony and an open-plan living room with a fully equipped kitchenette. A Nespresso coffee machine is provided. A private bathroom is fitted with a rain shower and a hairdryer. Towels and linen are included. Studio with a terrace and an open-plan living room and a fully equipped kitchenette. A Nespresso coffee machine is provided. A private bathroom is fitted with a rain-shower and a hairdryer. Towels and linen included. Apartment with an open-plan living room and a fully equipped kitchenette. Nespresso coffee machine is provided. A private bathroom is fitted with a rain-shower and a hairdryer. Towels and linen are included. Apartment with a large terrace and an open-plan living room and a fully equipped kitchenette. Nespresso coffee machine is provided. A private bathroom is fitted with a rain-shower and a hairdryer. Towels and linen are included. This rooftop penthouse apartment has 2 bedrooms, a living room, a south-facing balcony and a kitchen. The elevator takes you right into the apartment and the living room is equipped with a fireplace, a satellite TV and free WiFi. A private bathroom is fitted with a rain-shower. OUR PREMIUM APARTMENTS @ Monte Rosa are located in Täsch. This is the last village before you reach Zermatt and the Matterhorn. You will love our apartments because of the combination between PREMIUM accommodation and Apartment Resort with staff, pool and parking lot. You can use the public areas and facilities of the surrounded apartment-resort. The PREMIUM APARTMENTS @ Monte Rosa are handled and operated through The BEST WESTERN Hotel Butterfly in Zermatt. 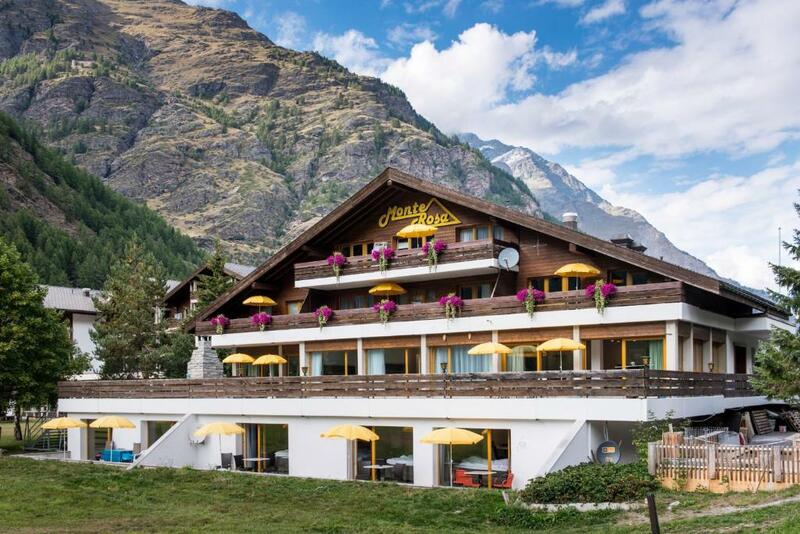 This company has more than 30 years of experiences in Zermatt and with thousands of happy guests we guarantee for YOUR vacation in the mountain-paradise. For all requests or bookings or ALL your other questions, you can reach our professional's daily per phone or e-mail at the BW Hotel Butterfly from 7:00a.m. to 11:00p.m. Täsch is the last village before Zermatt. Zermatt is car-free and everybody comes by shuttle-train from Täsch to Zermatt. The shuttle runs every 20min and you have a 15min ride up to the mountain paradise. In-between Christmas and Eastern you have several shuttle trains who stop direct at the resort train stop so you can go straight to Zermatt. House Rules PREMIUM Apartments @ Monte Rosa takes special requests – add in the next step! A CHF100 damage deposit is required on arrival (around USD98.26). This deposit will be fully refunded 7 days after check-out, as long as there isn't any damage to the property. PREMIUM Apartments @ Monte Rosa accepts these cards and reserves the right to temporarily hold an amount prior to arrival. Please inform PREMIUM Apartments @ Monte Rosa of your expected arrival time in advance. You can use the Special Requests box when booking, or contact the property directly using the contact details in your confirmation. A damage deposit of CHF 100 is required on arrival. That's about 98.26USD. This will be collected by credit card. You should be reimbursed within 7 days of check-out. Your deposit will be refunded in full by credit card, subject to an inspection of the property. We visited it before and it was very convenient to have a breakfast in the local restaurant and also it was a good option to eat there at the evening. It's a pity, but now it is closed (may be due to a small number of visitors). Lock in the toilet didn't work. Ski room box was w\o keys. Some smell on the way to garage. beautifull spacious rooms, including the well equipt kitchen, open plan dining room and lounge. lovely balcony! It's a bit far from Tasch station by walk, especially with a heavy suitcase. It was a perfect stay while we were in the apartment. It takes a little bit long distance from Tasch station to the apartment. We were amazed by the overwhelming mountain view while we were entering the apartment. The overall layout is spacious and comfortable. My families and I (4 adults) could get very well sleep in separate rooms. The well-function kitchen makes our stay even warmer and easier. There's a small train station (Monte Rosa) providing the daily commuting from hotel to Zermatt/Randa. (even the service only provided in early morning, and late afternoon). Anyways, I highly recommend the apartments for group, skier, families and couples. You will have a amazing vocation by staying here. Not really much to do in Tasch, not in any way the hotels fault, just the way it is. To get to anything you have to take the train to Zermatt which can get expensive. I suggest doing a train pass for a few days rather than one trip at a time. The reception area in the other building is dreadful and does not do the premium apartments justice. The receptionist was very nice and helpful and always on call, but the reception area is in need of modernization and gives a bad first impression. For the same reason we did not use the swimming pool that much. Also the journey from our apartment to the top of the mountain (including train, bus, ski lift) took about an hour, so by the time you get back at 5:30pm and have had dinner it was 7:30pm, but the pool closed at 8pm, it would have been nice if it would have been open a bit longer. Great modern apartment with view, well equiped kitchen and good WIFI. There was no place in the parking garage of the building, but we could park our car at the parking lot just in front. We stayed for New Year’s so the train stopped at Monte Rosa, just a couple of minutes walk and took 15 minutes to Zermatt station. At the end of the day not all trains stop at Monte Rosa, but if it stops at Tasch, the walk from the station to the apartment takes 10 minutes. There is a supermarket just across from Täsch station. We rented our skis and shoes with a locker at the ski rental across from Zermatt station which worked really well. The cleaning products were very few and for people who stay more than 3-4 days new towels, pillow covers and so are necessary.We stayed 7 nichts without any changes to these stuff. The location, 2 TV, the view, free protected parking, balkony, the Toilette. Disappointed the fitness center and pool were closed during our visit. Wish that had been made clear up front that November is an off season and therefore pool was closed. It was the deciding factor in my reservations choice for the area, as I was traveling with kids. The apartment was exceptionally clean and comfortable, with plenty of space for our group of 6. The train stop and a grocery store were within a 10 minute walk, we were able to do breakfast and supper in the apartment which was relaxed and enjoyable. Parking was available and convenient. The staff was responsive when called and friendly. WiFi was great and supported the needs of the group. Would definitely stay there again as the entire facility was excellent overall. Very nice apartment, cosy, clear. Parking in garrage and swimmimg pool at available. We spent nice holiday here. The room lighting is awful with only bright neon overhead lights. The staff on the phone was a bit brusque. The high chairs were a bitt difficult to manage. Staff never around. Had to get key from a box at check-in and leave again at checkout.